​​"A hugely important aspect of our programs is giving kids a moment to themselves to stop, breathe, and create. It doesn’t matter if it makes a mess or how it turns out. There’s no pressure or expectation, just the opportunity. ​I really feel that we’re all continually pulled along the spectrum of highly structured organized time, which is necessary to get things done, and the ridiculous chaos of life. Creativity happens somewhere in the middle. Of course, some kids exhibit obvious artistic talent and could further develop their skills more formally. Our preschool programs are designed to be a gentle, joyful introduction to school for your children, and help them prepare for kindergarten. ​The primary goal for our preschool for two-year-olds is to provide a happy and safe environment where the children are free to explore and discover new and wonderful things. We encourage them to interact with a variety of toys and materials, and we seek to maintain a good balance between individual and group activities. There are a lot of hugs and cuddles in this program! When: Tuesdays and Thursdays from 9:00 - 11:30 a.m. The 3's program is very similar to the 2's, with increased focus on social skills and more individual participation during circle time. Programming is based on a themed approach where the children's ideas and related experiences are greatly valued and incorporated. 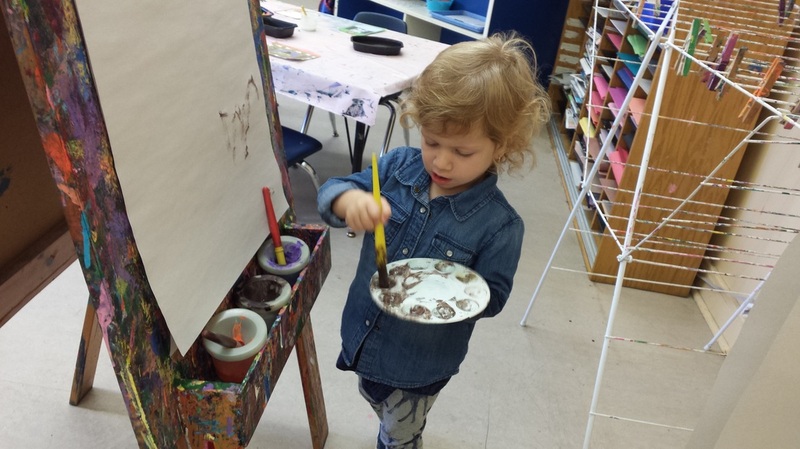 We offer a supervised lunch program Monday, Wednesday and Friday for children in our 3's Preschool, and on Tuesdays and Thursdays for children in Storyscapes. It is a great way to get your children ready for eating at Kindergarten and self-regulating their intake, as well as the social aspects of eating with their friends. What comes first? What is last? It also gives parents and caregivers a little extra time in their day to do what needs to get done, because we all know how quickly those preschool mornings can go by! *Note that this program cannot accommodate all of our three-year-olds registered in the morning program. If you are interested, please register early. This introductory art program is geared for younger children (ages 3-5) who are ready for more structured activities. Each week we introduce a new book adventure and use the book theme as the basis for our art projects and drama activities. Great for children who are registered in full-day kindergarten but would benefit from some class time offering a lower teacher:student ratio. “Some children aren’t really drawn to letters and reading. But books are now more important than ever. They can engage and inspire our children more deeply than screens. So we invite the children to share their favourites, expose them to new stories and old classics, and develop thematically related activities. The point is not to recreate the pages with drama or art but to make room for inspiration and let them run with it. Given the space and opportunity to express themselves, the children are brilliant. It’s a gentle, fun, and creative way to foster early literacy." We offer after-school art classes for ages JK-Grade 6. These classes focus on each child’s creative side, offering a balance between learning new concepts, experimenting with materials and tools through art and drama, and socializing with friends. Wonderful creations are produced in each class, although we like to stress that the focus is on the process and not the product! This is a stimulating and caring after-school art program where the children are encouraged to help plan our activities. We explore the works of famous artists, the elements of art, and a wonderful variety of materials. This class includes a nutritious snack. When: Runs every Tuesday, Wednesday and Thursday, from when school ends to 5:30 pm. We will consider adding Monday and Friday if there is sufficient enrollment. Drop-offs: If you are bringing a child from another school, we are usually back at Good Morning by around 4 pm. Ages: Open to children ages 3-8. Your child must be at least three years old on the first day of camp. Mixed age groups give the bigger children a chance to learn gentle leadership; younger children get to be inspired by what the older ones can do.